Company Picnics. Team-building parties. Grand openings. Tradeshow or festival booths. We can kick start the fun for adults and children alike. Face painting and craft projects are a great way to break the ice and get adults and children to shed their inhibitions and have fun chatting and interacting. We can also help you attract loads of people to your tent sale or grand opening. Or to your neighborhood festival or tradeshow booth. 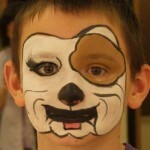 Thanks to our artistic face painting, kids and their parents will definitely remember your business. Plus, when people see these kids (or their pictures) with wonderful face art, your business name will be mentioned and praised. Just the kind of word-of-mouth advertising you want!